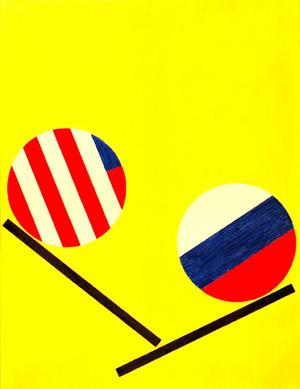 CONDITIONS OF SALE: Painting has to be exhibited free of charge permanently until the begging of a military conflict between Russia and the United States. STORY: There are only two large countries left that didn&apos;t lose any significant military conflicts. Their flags are represented as two rolling balls, both on steep inclines, and their clash seems inevitable. Yellow background and black planes are colours chosen to suggest that the conflict may indeed be nuclear, even though the world stockpiles of nuclear warheads have been reduced to about 19,000 in 2012. Nuclear weapons have not been used in any serious military conflict yet, and human nature dictates that it is inevitable they will be used. People do not realize that a nuclear war can be won without too much harmful radiation on land. For example, submerged nuclear explosions can cause giant tsunamis that can devastate most of the large cities in the western world (incidentally built around large ports) and practically paralyze military defenses of those countries. Their land would be quite suitable for invasion shortly afterwards. One would hope that there are people paid to think these scenarios through and envisage effective preventions! Note that this complex story was achieved with only using primary colours, which is an ideal AbFab scenario.